The Dönnhoff family first came to the Nahe region 250 years ago, establishing a traditional farm in the village of Oberhäusen an der Nahe, which included livestock and vegetable gardens in addition to some grape growing. Oberhäusen and this part of the Nahe river valley is very pastoral; it feels far away from the relative hustle and bustle of the Rheingau and wine tourism. This is not Napa Valley. The countryside is serene and beautiful, marked by steep hillside vineyards in the succession of villages following the river from Norheim to Niederhausen, through Oberhäusen, ending in Schlössbockelheim. Helmut is a very instinctive winemaker with a natural touch that he’s clearly passed on to his son Cornelius, who joined him at the winery 2007. The Dönnhoffs believe in craft and workmanship with the understanding that “winemaking alone cannot bring quality; it can only retain the available quality.” In the 40+ years that have passed since Helmut began his work some things have changed and shifted, but the commitment to excellence and transparency above all has remained constant from one generation to the next. “It has been a long road,” remarks Helmut, looking back at 44 vintages and a period when his wines were not always as internationally recognized and lauded as they are now. 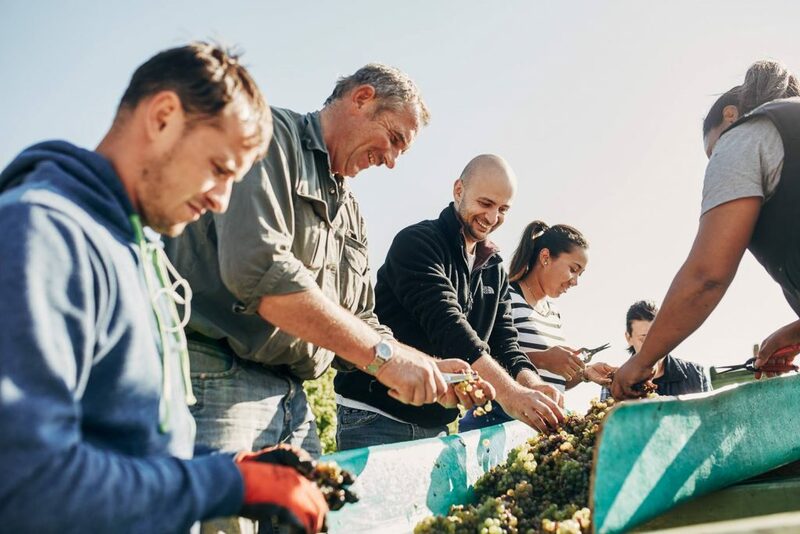 The Estate has grown to 25 hectares but both father and son feel that this is as large as they want to be; more growth would mean less time in the vineyards and cellar, where they feel most at home and in their element. Cornelius is as thoughtful as his father and the two share the same view on winemaking, viticulture, and taste in wine; balance and “Das ganze ding muss klingen – The whole thing must be sound” are at the center of their philosophy. With the addition of Norheimer Kirscheck and Dellchen in the mid-1990s and Roxheimer Höllenpfad in 2010, the estate is comprised of nine different single vineyard sites, all classified as Grand Cru. The fact that Dönnhoff selects only three sites to produce Grosse Gewächse-style wines is natural when discussing wine with the family. “We have to think of what we can do for the vineyard – each one has a special talent,” says Cornelius. Grapes are handpicked at the height of ripeness rather than by sugar levels, and each site is fermented individually with native yeasts. The winery was designed to have total capacity in either oak or steel, allowing Dönnhoff to vinify and age wines according to what they feel the wines need, not what they have room for. The oak here is Stückfass (1000 Liter), made from an incredible cooper in Bad Kreuznach called Hösch, not well known outside of Germany. The wood for Dönnhoff’s casks comes from the Lemberg forest, directly across from the Leistenberg vineyard. The staves are twice as thick as the average 1000L cask and are seasoned outside for 7 years at the minimum, often for 12 years, which results in a very neutral barrel. 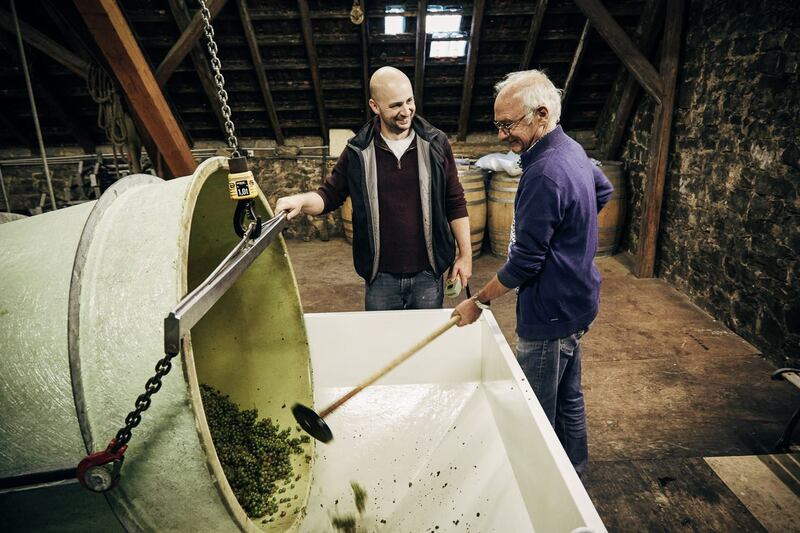 Regardless, Riesling never goes in a new cask here – the first three passes are used for Weiss and Grauburgunder. If a wine has had enough oxygen in oak it will go into barrel and vice versa. Many tasters assume that all of Dönnhoff’s wines are 100% in steel as there is never perceptible oak flavor. Decisions for elevage are made by taste and taste alone – analytics are ignored. “I make wines for myself, not for the market,” says Helmut. The estate recently became part of Fair’n’Green, a new sustainable certification that is supported by both the German Government and the Frauhofer Institute, one Europe’s top research organizations. This certificate doesn’t involve money from any of the wine growers involved; it is not a marketing tool, but a way for growers to share information and improve wines and vineyards for the future generations. Schlossböckelheimer Felsenberg is a steep vineyard with the very best steep parcels around the Felsentürmchen in the midst of the magnificent Schlossböckelheim Felsenberg site. The story is that this castle was built by an Italian Count for his German bride, on the spot on the hillside where the last rays of sun hit the mountain on the longest day of the year. Outstanding Riesling terroir with a soil of red volcanic igneous rock, a mélange of porphyry and melaphyr. Very expressive, minerally Riesling wines and vigorous Grosse Gewächse (GGs). Oberhäuser Leistenberg is a steep, southeastern facing slope with grey slate soil. The morning sun dries the grapes, keeping them healthy, while the afternoon sun is not so direct, allowing the grapes to ripen over a long period without becoming overripe. A perfect vineyard for Kabinett wines! Oberhäuser Brücke is the smallest single vineyard (1.1ha) in this valley and a monopole site directly by the river, which regulates the temperature. Grey slate bedrock with loam and volcanic elements. Brücke often ripens even later than in the Hermannshöhle due to wide diurnal temperature swings along the river. Niederhauser Hermannshöhle has been rated the best site in the Nahe for more than 100 years. It’s the benchmark by which all other sites in the valley are judged. Perfect, steeply sloping vineyard. Blackish grey slate soil with volcanic elements. Magnificent wines, dry Grosse Gewächse and noble sweet Prädikat wines are produced here. The soils are different in each parcel and the decision for style is based on the site and flavor of the wine during fermentation. Norheimer Dellchen is a steep, terraced hollow in the volcanic cliffs rising from the Nahe river. Soils here are a mix of slate and porphyry, producing outstanding wines of mineral elegance. Norheimer Kirschheck is one of the oldest recorded vineyards in the Nahe. Kirsche means “cherry,” and the old name suggests that wild cherries grew in the vineyards. It’s a steep south-facing site with weathered grey slate and sandstone soils. Kreuznacher Kahlenberg was first mentioned in 1499. It’s a southern slope of gravelly loam, perfect for dry wines with the characteristic spicy flavor found in wines of the Nahe. Kreuznacher Krötenpfuhl is rich in quartzite and gravel for perfect drainage. Krötenpful means “turtle pond” and is named for the water source in the vineyard. Roxheimer Höllenpfad is a very famous, steep, south-facing vineyard of weathered red sandstone, similar to the Roter Hang of the Rheinhessen. The old name Höllenpfad means “path to hell” and was likely named for the red sandstone, an anomaly in the Nahe.